← Why do we play this game? Putters are very important clubs. When you think about it, we use them more than any other club in the bag. I average something like 2.1 putts a hole so that is something in the region of 38 putts a round and, for me, more than a third of total shots. Putting is possibly the easiest shot to practise as you can do it in the house with nothing more technical than a spare cup on the floor. Of course a flat living room carpet is not exactly the same thing as a real green but know what I mean. More than one person has said to me that the choice of putter is a very personal one. I couldn’t agree more. There are guides out there that will tell you “if you putt like… , then get a … style putter”. I would argue that it is much simpler than that. My advice when trying to figure what kind of putter works for best you would be: “go to a shop and try out as many different types as you can”. That’s what I did and I am really happy with how things worked out. As I have talked about in the first post on this blog, I returned to the world of golf last summer and dug out a complete set of Dunlop clubs that I’d had for a couple of years without ever using more than once. I had got chatting with an old mate who played golf when I picked up the clubs. I didn’t know anyone in my local social circles who played so I wanted to chew the fat with someone who was into the game. Cue lots of Whatsapp conversations. One evening after we had exchanged a load of Ebay links to “bargain” drivers, it occurred to my friend that he had an old but in reasonable condition driver in his spare room that I could have! So, with a decent driver to replace the Dunlop one, what would be the best return for my money in upgrading my clubs I thought? Well, for the reasons noted above, the putter seemed the obvious choice (and there would have been no way I could have justified the cost of a new iron set at that stage in my golf journey). So, I started back on Ebay, this time looking for a club to hit the shortest shots of the round! I literally didn’t know where to start. 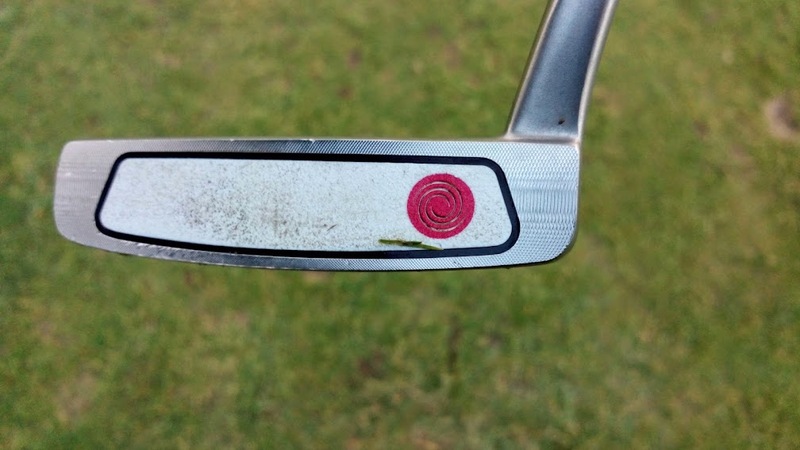 My mate suggested a “two ball” putter but they just didn’t appeal to my aesthetics at all… Subsequent Googling and a quick hunt around some golf forums again left me no closer to having a good idea what to go for. With a host of different shapes and sizes to choose from it occurred to me that there must be variety in the feel of the clubs. This would be something I could never find out without physically holding them was the conclusion I reached. So, I took a wee drive to my local branch of American Golf. The guys treated me very well and were extremely friendly. I explained I was in the market for a new putter and was referred to the shop’s “putter expert”. He asked what my budget was and I replied non committally and he didn’t pursue it any further – I think he sussed out that I wasn’t buying anything that day. I explained that my experience was pretty limited – I had really only used the Dunlop putter that came in my set which was pretty conventional looking. He took me over to the putting area and showed me a few different clubs which I tried out on the (slightly bumpy!) instore green. I tried out a few different clubs, mostly in the sub £100 price bracket. They were nice enough but there were no real standouts. Nothing really grabbed my attention and made me think “I need this club”. Then, I think more to show off the store’s extensive range of putters than as a genuine realistic option, my putter expert showed me a Scotty Cameron club. It was a thing of beauty with utterly gorgeous machine detailing and felt so nice in my hands. I then took a few shots – around 8 I think – at the hole from about 10 yards and sank every single one of them! So, clearly a non starter at that price range. I had been giving the issue of buying a new club some serious thought as in my wife’s eyes, any money spent on golf is superfluous. I had to keep a new putter purchase a lot less than two hundred and fifty pounds! For some reason this just struck me as the way that a putter should be designed. But that price was just a non starter. I left American Golf after thanking the staff and picking up a few lake balls and returned home to Google some solution to my quandary. You can see that it has a fairly similar design, with the hozel set right back on the heal. I liked it. 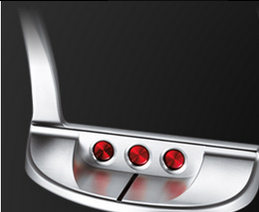 Retail prices were around £70 to £80 so it put it at a much more realistic price range than the Scotty Cameron. Ebay is a wonderful thing. 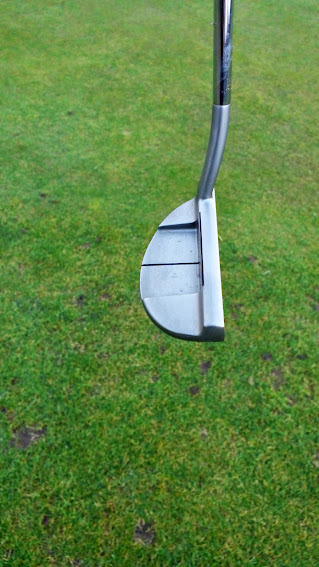 Within about ten minutes of deciding the White Hot XG 9 was a putter I quite liked, I had found a seller in Telford (which was about a 45 mins drive from my house) listing an apparently hardly used club at £35 buy now! It was a pick up only listing but that suited me as taking delivery of packages could be a pain at times and the petrol costs were probably lower than typical P&P for golf clubs. The transaction was made and I made contact with the vendor to get his address and arrange a time for me to pick it up. The next day I had my new club. Earlier in this post I talked about not being able to feel a putter without holding it and to an extent I was taking a bit of a gamble buying a club that simply resembled one I had fallen in love with. The first time I used it though, I knew that my gamble on the White Hot XG 9 had most definitely paid off! It feels lovely in the hands. The head has a really nice weight to it (without being overly heavy and making swinging it a chore). It just feels like it swings itself. 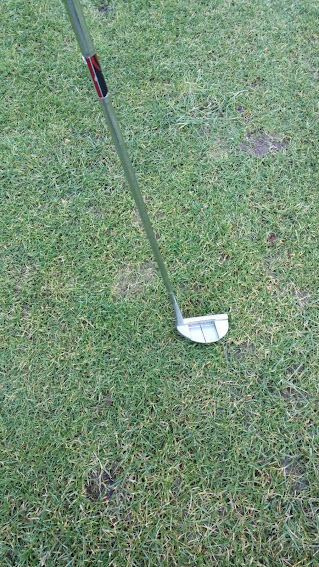 I like the way it addresses the ball and it seems to suit my putting action. Clearly American Golf or whatever pro shop you frequent would prefer you to purchase your lovely new putter from them but even if you, like me, prefer to bargain hunt the virtual aisles of Ebay, I would most definitely recommend you go to a shop and try some different putters out before you buy anything. This entry was posted in Equipment and tagged Equipment. Bookmark the permalink.